“Screamingly fresh King Salmon flies…didn’t Bobby Flay do this scene?” [A reference to the showmen fish stand in Pike Place Market who throw fish and back and forth for the crowds’ enjoyment]. I am a big Bourdain fan. I preferred No Reservations to Parts Unknown because it seemed like he checked out in the latter. It had a feel similar to what I think The Chapelle Show would’ve had had Chapelle not chosen to step away when he did. I appreciated Bourdain because he seemed to capture the essence of a place well, although there, too, I can knit pick. I’ve spent a lot of time in Israel, including a year living in Jerusalem, and his episode there was a disgrace. It was done by a guy who in this case didn’t know how to handle the politics of the area. He tried to find a middle ground, which is a straight, inevitable shot to absolute failure in that part of the world. You either go there, or you don’t. He did neither. But episodes like the Pacific Northwest showcase Bourdain at his best. Having grown up there, I enjoy the PNW episode. I also think he got it reasonably right as a region of obsession. His disregarded caricatures aren’t inaccurate, though they are cliché: 300ish days per year without sunlight, beautifully lush and tall trees, an addiction to caffeine, grunge and flannel (the latter, however, the opposite of “totally over” – PNW hipsters, I see you), and salmon all were and remain quintessential PNW (though Amazon’s presence is significantly and unfortunately changing the cost, way and feel of life there). These elements, and many more, have combined to create a region of utmost quirkiness in which people tend to find one or two things and obsess over them to an extent that the people I’ve lived around in the Midwest and East Coast would find peculiar. Bourdain was no wine lover, a fact he mentioned frequently in his shows, so it came as no surprise that his PNW episode made no substantive mention of either state’s world class wine scenes. It’s a shame, because there’s no better example of obsession in the PNW than it’s winemakers. And just like that, I’m stealing the concept of obsession to frame this article on a recent trip I took to Willamette Valley (it’s like you hardly noticed). I landed in Portland on a Monday with enough time to meet up with Jesse Skiles, the owner and winemaker at Fausse Piste, a Portland-based winery that sources grapes from Oregon and Washington. Along with Seattle friends of mine who drove to Portland to join us for the trip, we met at Ok Omens, a self-described “naturally focused wine bar” and favorite among the wine-making crowd. This was my first time meeting Jesse, and over what turned out to be a multi-bottle dinner and, afterwards, an impromptu cocktail session with a group of winemakers who happened to be hanging out at the restaurant, I enjoyed getting to know him. Jesse sells his wine in my area (Washington, DC) through Weygandt Wines, which makes perfect sense given his wine proclivities. While Weygandt sells a good deal of wine from classic Old World regions like Burgundy and Alsace and the Wachau Valley, it also brings in small, niche domestic producers like Fausse Piste, Arnot-Roberts, Cameron, Ceritas and others. These are small producers with, as Bourdain would say, a maniacal obsession of unique personality for whom winemaking is a cause. Attention to details – all of them – is rarely sufficient. Exploration and experimentation are constant, a total and humble fixation on trying to understand and do their craft better. Take, for example, Jesse’s Duck Sauce, an insane skin contact viognier. The current vintage is 2013, which should raise eyebrows: it is fermented on the stems and skins for thirty days, basket pressed into 2 older French barrels where it sat on the lees for 3.5 years before enjoying a final six months in barrel without the lees, and is finally bottled unfined and unfiltered. Talk about an effort-riddled and unusual wine. Our group closed Ok Omens down after many rounds of wine and cocktails, an unanticipated effort for a Monday night. The camaraderie among the Oregon wine scene is pretty extraordinary, as this night intimated and the following couple of days confirmed. On this evening, everyone knew each other, also a sign of the relative size of the state’s industry. Portland is roughly an hour from the northern area of the Willamette Valley, and many from the industry live in Portland. Fausse Piste isn’t the only winery to go one step further and set up shop in the city, though Portland remains a relatively small incubator of wine production. The following Tuesday morning, after my fiancé arrived, we made our way down into the Valley for three winery visits before checking into our Airbnb. The remainder of this post will discuss our first stop, Martin Woods Winery. Part two will fill out Tuesday’s stops at Tendril Wine Cellars and Belle Pente Vineyard and Winery. Part three will cover Wednesday: Penner-Ash Wine Cellars, Trisaetum Winery and an introduction to Shane Moore. The final and forth part will cover WillaKenzie Estate, Zena Crown and Gran Moraine, the latter two labels that Shane produces. The owner and winemaker at Martin Woods Winery is Evan Martin. 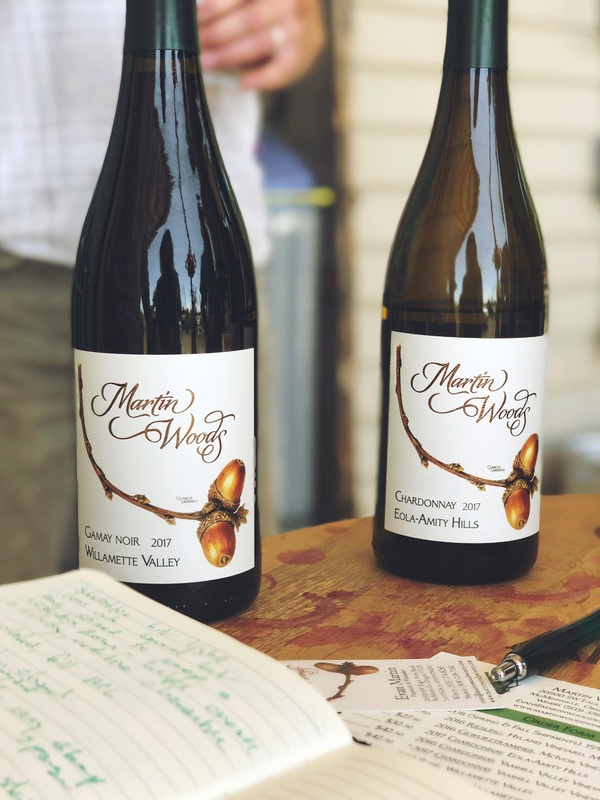 I couldn’t keep the respective names straight leading up to the trip, but once I arrived there it became clear: Evan Martin owns a nice plot of forty acres, much of which is hillside covered by trees at high elevation, and so it’s Evan Martin’s woods: Martin Woods Winery. Set high up on one of the Valley’s mountains, by the time we got to the top of the steep, winding gravel road, we were without phone reception. Evan doesn’t produce vitis off his land yet, though it is in his future. He intends to plant at 500-600 feet, which he thinks is the ideal elevation for his property. At that level, the land is Ritner soil series and exposed to cooling breezes that come from the Pacific Ocean via the Van Duzer Gap, a break in the Oregon Coastal Mount Range (and the heart of a proposed new AVA) that allows vineyards access to Ocean winds that cool the vines. This exposure helps keep the vineyards cooler and builds thicker grape skins, which is desirable for the kind of wine Evan wants to produce. Evan does, however, produce barrels from trees on his land. How many wineries do you know that do that? The idea is to make a truly Oregonian wine. Obsession. The theory is that wine leaches terroir when something foreign is introduced to it. Oregon grapes in French oak, which is the standard in the Willamette Valley, makes for wonderful wine, but it’s less Oregonian than Oregon grapes in Oregon oak. Evan chose the Quercus garryana tree for its particularly tight grain, which does not allow as much oxygen to pass through to the wine as French or standard American oak. This creates an oxygen poor environment that produces more reductive wines. The barrels create a unique tannin structure in the wine that Evan is still figuring out. He has yet to fill his barrel room entirely with his own barrels, in part because it takes at least three years to season (dry) the wood before it is ready to go to the cooperage, and Evan hasn’t been doing it long enough to make enough barrels to replace his French ones. The other reason that he isn’t fully Oregonian oak is that he hasn’t had enough experience with them yet to gamble his entire production on going 100% Oregon oak. But time is on his side, and it seems inevitable that he’ll get there if he wants to. Evan is a meticulous, thoughtful guy and we had high expectations when we got to the tasting portion of the visit. The juice did not let us down. We started with the 2017 Hyland Vineyard riesling, which is made with Coury clones from Alsace that were planted in 1973. The vast majority of Willamette Valley riesling is from German clones, so the Alsatian roots of his helps to differentiate the wine. Bracingly young, it’s texturally driven by the acid backbone. The skins were macerated at 50-55 degrees for four days and the juice fermented in flex (plastic) tanks that, unlike stainless steel, allows breathing so that the wine can develop, but without the impact of oak, which Evan believes overwhelms the variety. Flex tanks also prevent evaporation and the release of carbon dioxide, which helps keep the wine fresh and capture more of its nuances than stainless tanks. Though Evan isn’t sure flex tanks are the best vessel, they’re the best he’s found so far. The resulting wine is a serious one that will develop over time into a classic expression of the variety with a lot of depth, something that I don’t believe can or should be said about most American riesling. The next wine was the 2017 Eola-Amity Hills chardonnay, which came from a single vineyard of fifteen year old Dijon 76 clones. Due to the contract, he can’t designate it. This one was aged half in Oregon oak and half in French puncheons. I found it to be substantive, delicate and quietly elegant, and I wasn’t surprised to learn that a bit of lees were left in for the aging but not stirred as it settles into a very reasonable spot between lean and fat in the mouth. The layer of lees creates a reductive zone in the barrel that creates a flintiness that really set the wine apart. We followed this with a 2016 chardonnay from the Yamhill Valley Vineyard. Perched on a very steep slope with a lot of sun exposure from a sparse canopy, it’s a particularly stressed vineyard. The berries are small, and develop thick skins. They appear burnt, but are actually bursting with acid. He ages the wine in third to sixth fill oak, all of it Oregonian. It’s a texturally tense wine that begs for twenty to thirty years of evolution. Restrained at this stage, it does already exhibit a mean streak of twitchy, nervous and zesty acid that tantalizes. Evan told us that in its youth it’s best enjoyed over a week of being open as the extended oxygen exposure fattens it out. I’d be thrilled to rediscover one of these, lost in the back of my cellar, after a couple of decades. From there we moved on to the reds, beginning with the 2017 Gamay noir. This is a blend of four vineyards, though in 2018 he will forgo this wine to create two vineyard designates. Evan goes full carbonic and full cluster, which initially produces a “tannic monster” that over ten months it barrel softens dramatically. It’s ripe and acidic with loads of bright red fruit and florals creating a pretty and ethereal wine. And then it was time for pinot. The 2016 Yamhill Springs is made from Vadersville clones planted thirty years ago that tend to go through rather slow phenolic ripening on that site. Evan shies away from using whole cluster because he wants to keep the juicy acidity that this vineyard tends to produce. It has a lot of baking spice and dark fruit on the nose, which comes off chocolaty in nature. The wonderful texture sets up seriously layered flavors that are presented well on the back of sharply focused acid. The final wine was the 2016 Jesse James vineyard pinot noir, which Evan describes as his “power and grace” wine. This one is almost entirely Oregon oak (7/8ths). It has a rich, full mouthfeel but maintains an elegant tension established by bright acid and dense, fine tannin. “Power” and “grace” are appropriate adjectives for it. As we discussed the Jesse James, Evan gave me one of my favorite quotes from the trip: “acid is like salt in winemaking,” a statement that pairs well with another favorite quote about acid, given to me by a coffee roaster in Syracuse, New York: “acid is flavor.” There is serious substance to these wines, and it seems to come largely by way of the acid, which I believe contributes to the structure, flavor and feel more than the oak, which is delicate and refined. I think. After all, this was my first run-in with wines with Oregonian oak, and perhaps at least some of what I’m giving credit to the acid for ought to be fondly ascribed to the native wood. In a similar vein, the other theme that contributes to Martin Woods’ signature is the reduction that seems common among many of the wines. Not only does this enhance the balance and elegance of the wines, but when combined with the acid (and/or oak?) it builds wines that are set up for a long and mesmerizing aging curve. My hope is that I have more run-ins with Martin Woods wine. With additional experience, I would hope to discern better what I’m tasting in Evan’s wines. Between the acid, fine tannin and reduction, these are wines that stand out as unique among the crowd. I’m just not sure now, yet, what each of these three factors are bringing to the party. Regardless, they’re doing well together, and Evan’s obsession with improving each element promises even better wines in the future. In my mind, the ideal customer for Martin Woods wines is one that has copious amounts of two things: patience and cellar space. These are seriously underpriced wines given their impressive quality, ranging from $27 to $37 per bottle. This makes them no-brainer case purchases if you have the room. They will go through a fascinating evolution with long-term aging and therefore benefit from extended cellar time. True wine obsession embraces the living nature of wine and an appreciation that it thrives when given its best chance to live out its fullest and best life. Martin Woods is made for those obsessed with wine. The visit to Martin Woods was a great way to kick off three days in the Willamette Valley. Look for part two, a completion of this first day of the trip, soon.